It's only Wednesday. It's one of those weeks that nothing is really going on but it just seems to drag. I'd blame it on the end of January blahs, but the weather has been so crazy and un-January like that it hardly seems the reason. The last two days have been in the 50ies and 60ies with horror movie like fog and nonstop rain. Today temps dropped providing a nice think layer of ice over everything. Ice strong enough to bust the windshield wipers on our vehicle. It's just one of those weeks. So what do you do to combat the winter blahs? Plan a vacation? Dream of summer months? Hole up in the house until the weather is sane enough to be out again? So far this week we've treated ourselves to a sushi dinner which is a decadent splurge. Last night I went to bed early falling asleep on the couch by 8. Tonight I'm here with you and playing a video game w/ my hubby. Our go to game that cheers us up and takes us away from the blahs if only for a short while. Here's another fun way to get away from the grey winter days. 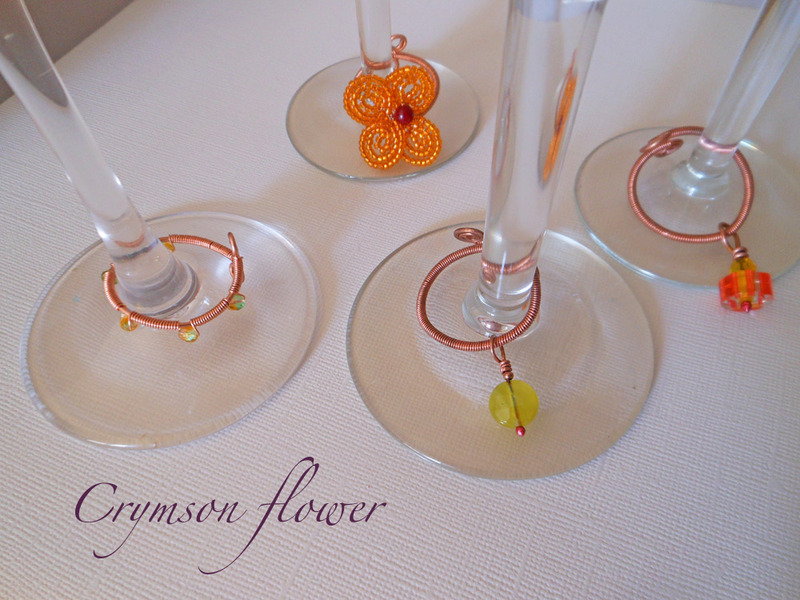 Put some of these bright orange wine glass charms on your glass and toast to summer. Toast to warm evenings with wine on the deck under the stars. Heck right now I'd even toast to swatting away mosquitoes in the July heat. Click here for wine glass charm purchase information. These little charms are super cute. 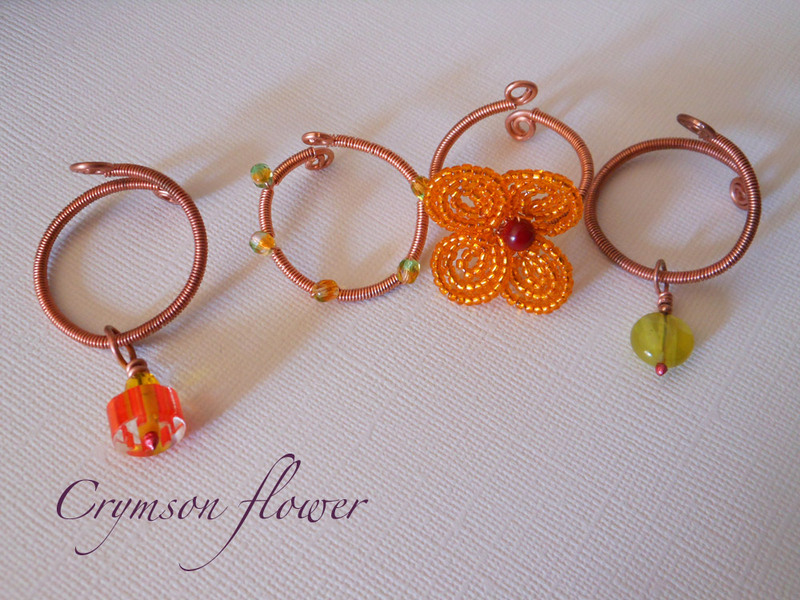 They provide a small splash of color to a blah January day. Each charm is completely different in color, style, and beadwork. Two with leaves, one with a cane bead, and the fourth with a flower. 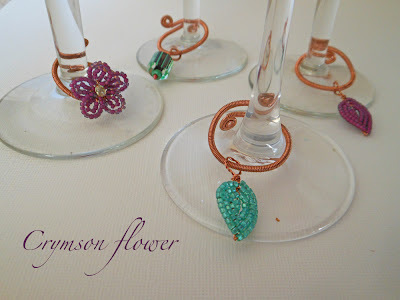 Each are on a copper wire ring that can be bent gently to attach to a wine glass. The copper will eventually tarnish to a dark brown which can be left that way or can be polished to get the bright shiny appearance. Each set has a different color theme. Go tropical with oranges or more earthy with greens. This set is my fave right now. Purple and teal is an amazing color combination. Who wouldn't like a glass of wine with a happy flower on it? 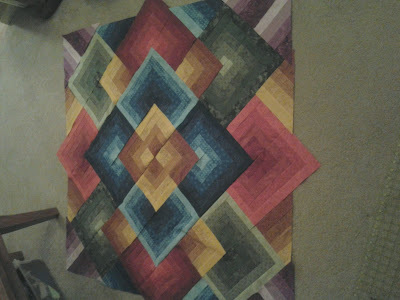 I split this weekend up between working on some wine accessories for the shop and working on the quilt. First the shop.... I came up with an idea for a wine accessory line that I'm super excited about. 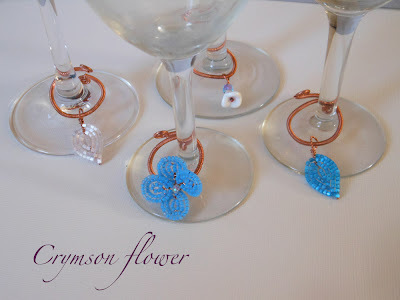 I'll have some small wine charms in the shop this week. Those are already made. These guys in the picture are totally new. I'll have better pics of them soon. 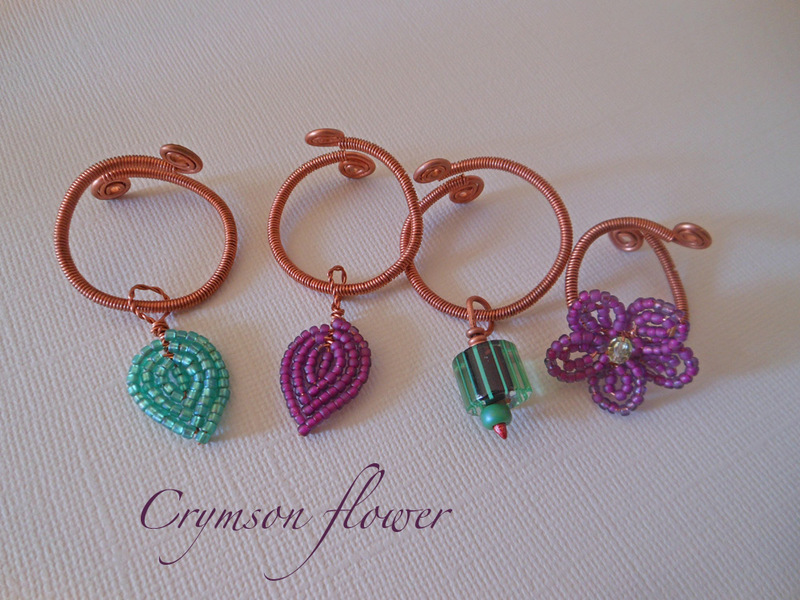 I'm sort of addicted to making them and I might have two more finished that didn't make this quick snap shot. The quilt is coming along. I have the top all sewed together and squared up. Unfortunately, I ended up losing about 15 inches because of fast sewing and not paying attention to seam size. I went slightly bigger than quarter inch seams instead of smaller which really shrunk everything up. Luckily I did it consistently and the pattern still looks good. The next step is to find backing fabric and figure out my borders. That means I get to go shopping this week. 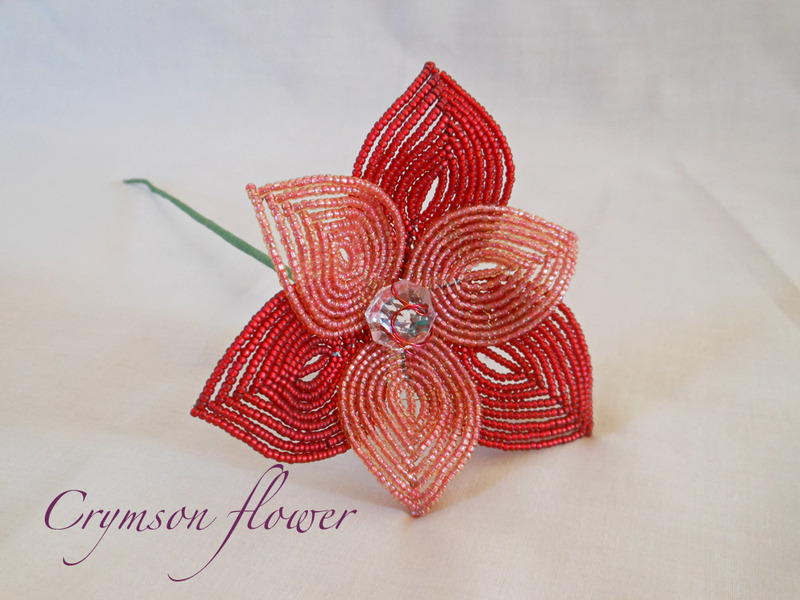 Here's my current version of a rose. 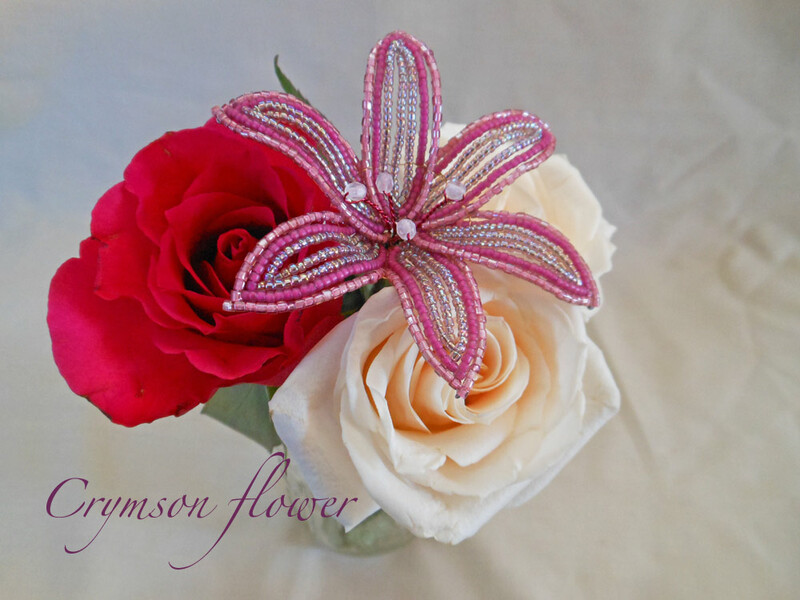 Roses are tough and always evolving for me. 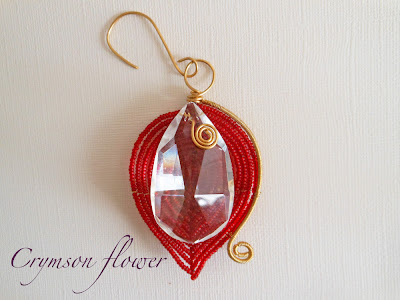 This is of course an open rose displaying the center which is made from a glass crystal from an antique chandelier and some colored wire wrapping. This rose is a bit bigger than the lilies, and has a nice weight to it. It can definitely hold it's own when paired with fresh flowers. 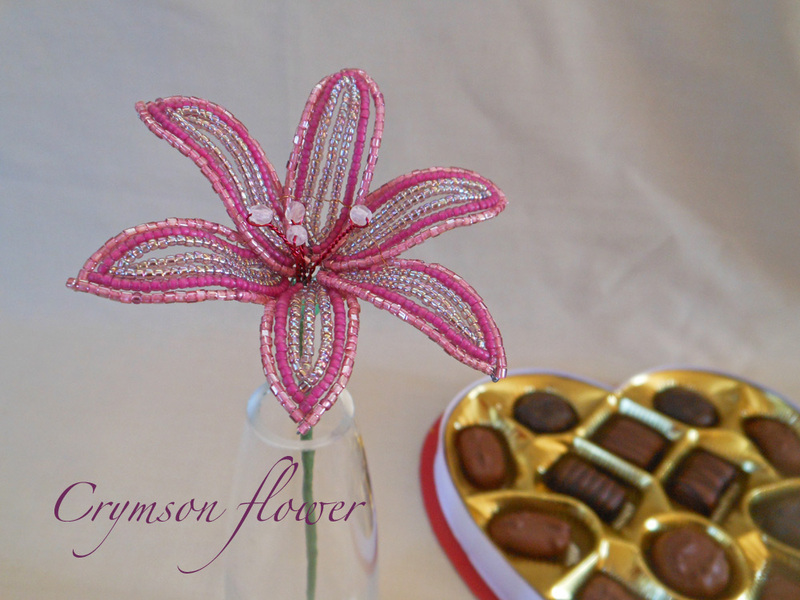 It's a romantic flower and would make a great Valentine gift. Click here for purchase information. I spent the holiday weekend up in Chicago with my parents and R. We had a nice time, checked out a local museum and played lots of dragons. When he slept I marathon sewed this quilt. It's still in pieces, but at least they are big pieces. The colors are a little off, in real life they are bright and glowing jewel tones. It's really a very cool quilt but it's been a pill to sew. I learned a lot about my quilting self this weekend. First it's hard for me to switch gears from bead to quilt mode. Each needs a different part of my brain and it takes a while for that part of my brain to wake up. I also learned that fabrics are important to me when I sew. This project is different in that the individual fabrics were kinda eh, so sewing each block was a bit laborious. But when the blocks get put together the individual fabrics blend together to get this really amazing result. 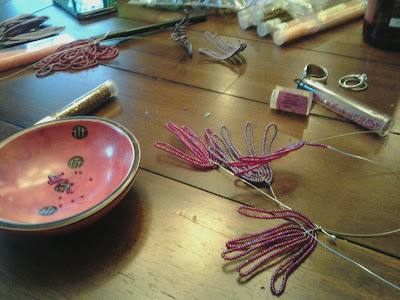 This week it's back to beads for me. It's cloudy outside so not a good photography day. I'll be listing some new flowers in the shop today and creating some new items for the wine accessory line. 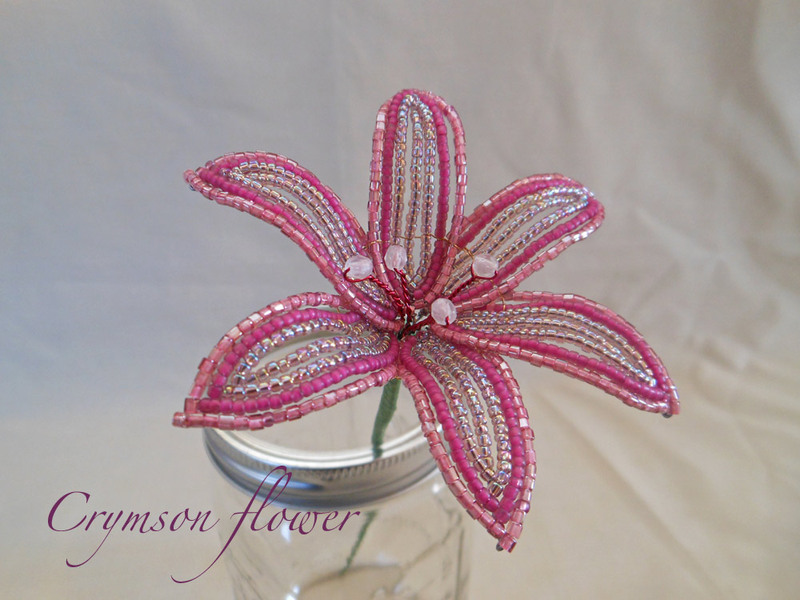 Here's a lily I made that I was thinking would become apart of a wedding bouquet. 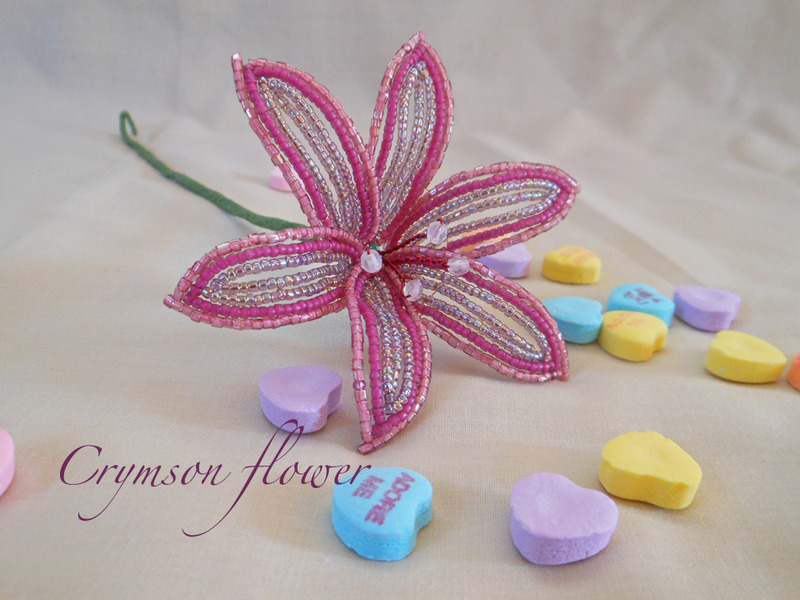 It didn't end up going that far and I thought it would make a great Valentine for someone special. 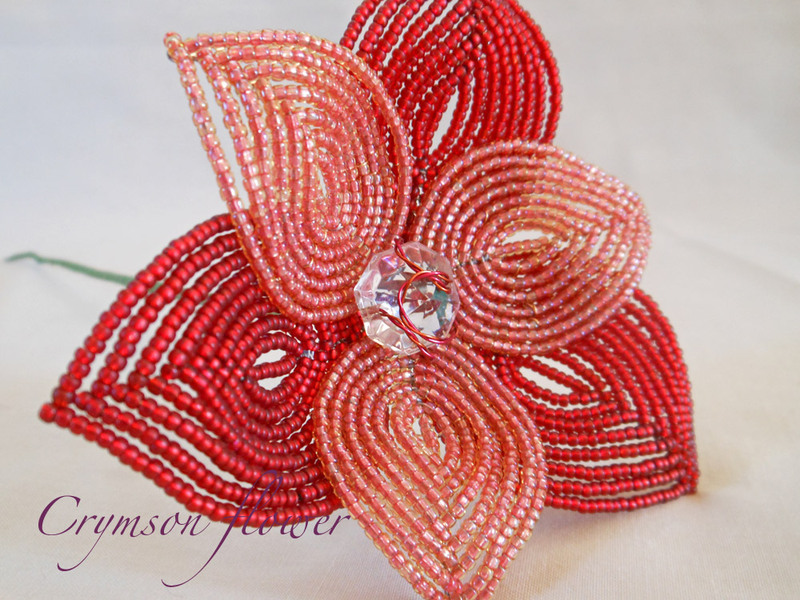 I went a little crazy with the beads on this one. 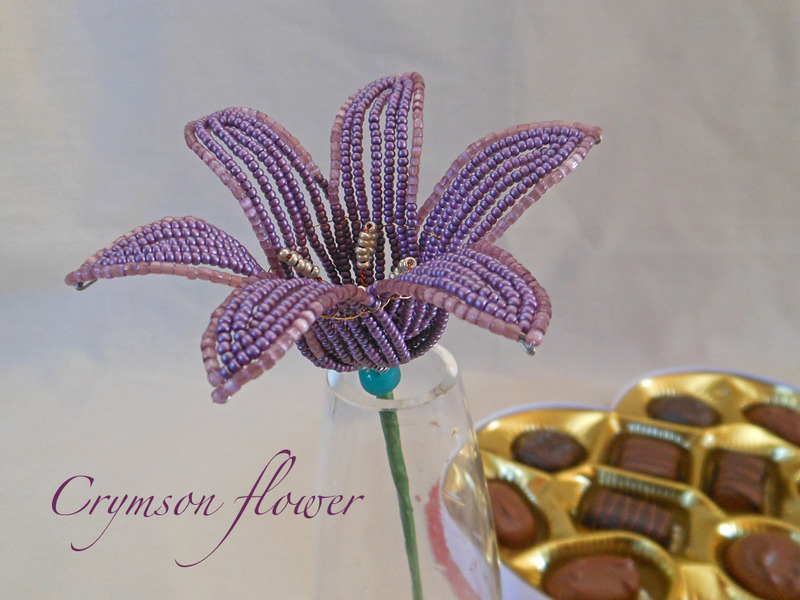 The center of each petals is a very very light lavender, followed by a matte fuchsia bead, and finished with a 3 cut light purple seed bead. The petals start off subtle then the bright fuchsia and sparkle of the 3 cut beads really end up packing quite a punch. 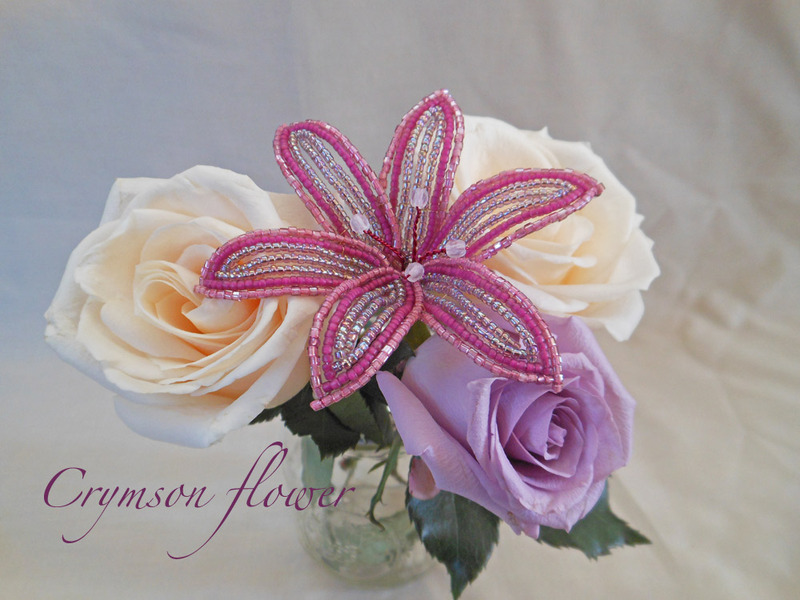 This flower makes a statement. I love how the flower's statement changes with the colors around it too. 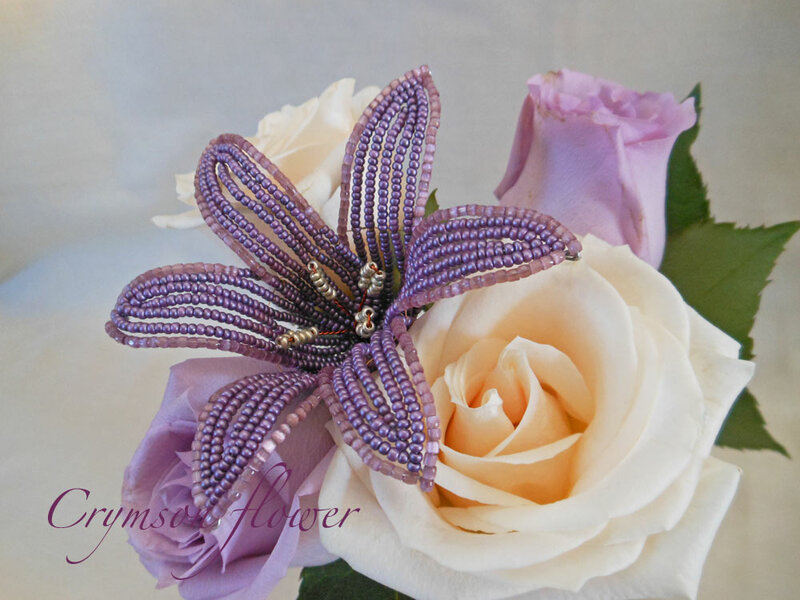 It's more slightly more subtle and petite when paired with the lavender roses, but next to a bright pink rose the beaded lily really comes alive. 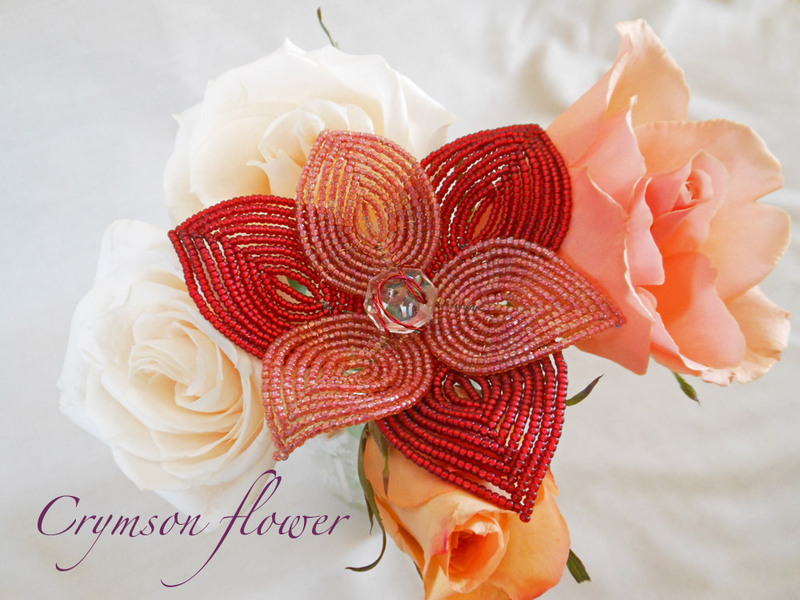 Very versatile, it would work nicely for a wedding someday. On a different note, we're back up in Chicago this weekend. This time at my folk's house. I'm attempting to switch my brain from bead mode to quilt mode for the weekend. I'm making a quilt for a gift and have a fast approaching deadline. I'm hoping to make big progress this weekend. Hope everyone stays warm...temps are supposed to drop here in my neck of the woods. Valentine's Day is quickly approaching and I've been working steadily to get some flowers in the shop perfect for someone's special Valentine. The first one I came up with was this simple lily. A simple purple bead surrounded by satin finished lavender beads makes each petal special and really sparkle in the light. 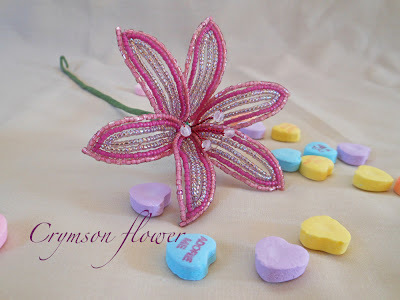 This lily looks lovely solo or mixed in with fresh flowers. 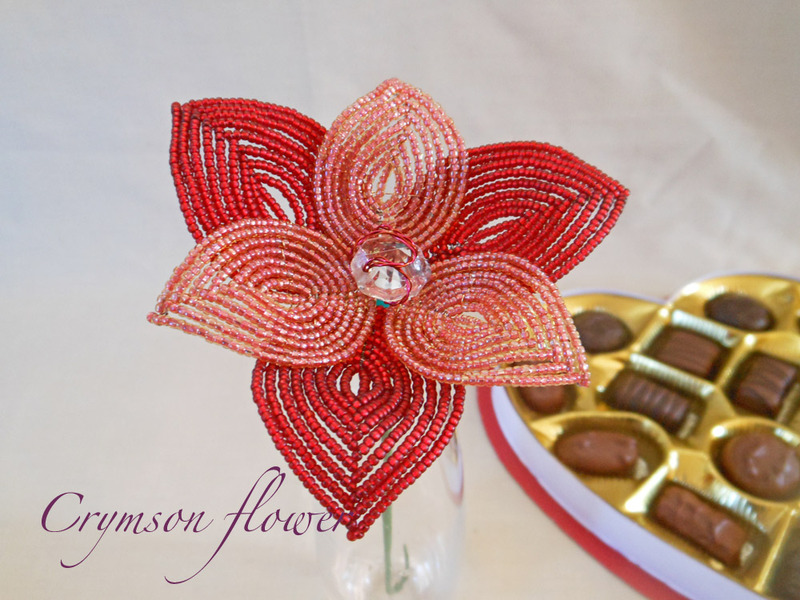 Combine with candy or chocolate for the perfect Valentine gift. Purchase information can be found here. Here's a quick shot of my living room this afternoon. I took over half the living room shooting photographs of the new Valentine flowers. It took me 45min to work out the kinks and get a good set up going. Then another half hour into it the sun disappeared and then the battery in my camera died. 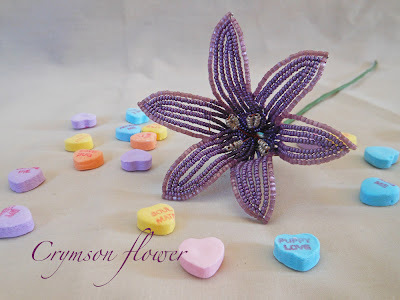 At that point in time I started eating some of my Valentine props. I'll spend the evening going through the pics to see if I got anything usable. I might be out at the store again next week buying new props! And yes that is my "helpful" upside down cat in the background. She likes to think that if she's upside down she's either invisible or too cute to scold if she tries to eat something. We were out of town this weekend. A quick trip to Chicago to see family and relax. While R napped I pulled out some beads and got to work on some Valentine flowers. Here we have a lily and an iris in the works. Last night I skyped w/ M during the Golden Globes and that iris got put together and laced up. Finishing touches and pics this week. 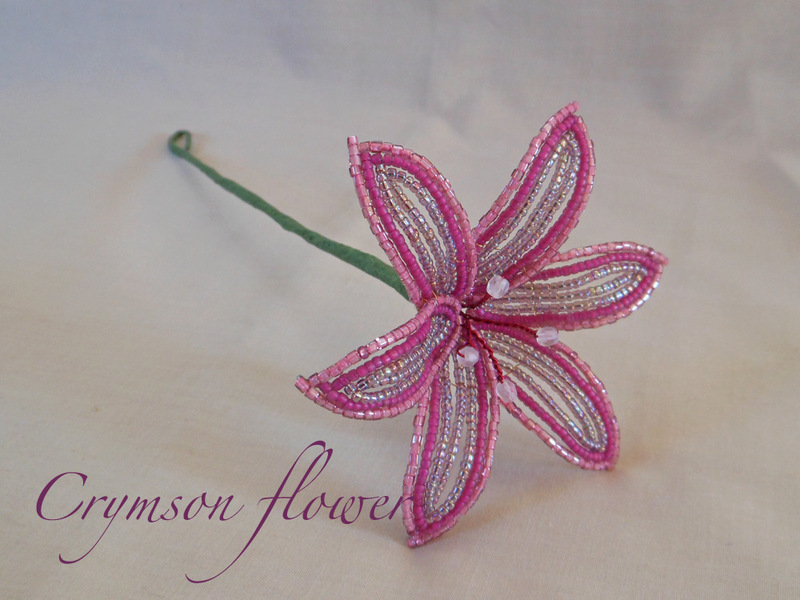 And it's live, Crymson Flower has it's own Etsy shop!!! I couldn't wait any longer with out feeling like I was chickening out or just plain procrastinating. So the Crymson Flower etsy shop went live this morning. And with that came a bunch of links on the back end that I need to explore. I'm also finding lots of small details that need editing. Same with the blog here. Small edits and details that need attending to. 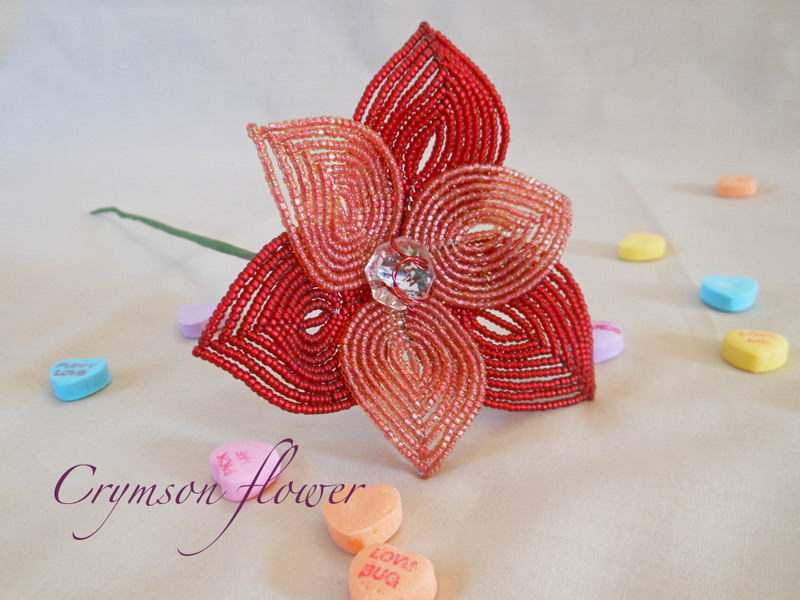 Currently, I'm making Valentine flowers like crazy so keep your eyes open for those and some wine charms in the near future. 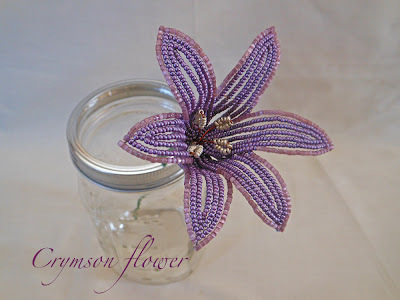 For now you can find this Violet ornament and a few others in the shop. Here is one example of the new ornaments I made all last month. A friend from work recently bought a house and he was updating the lighting. He gave me a bag full of old crystals from the chandelier that came with the house. 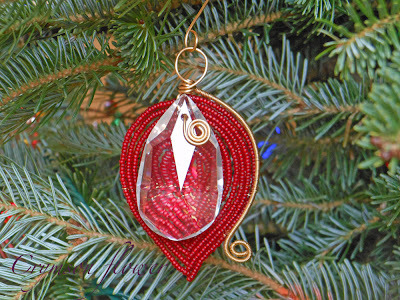 I used a bunch of these crystals in the ornaments. I'm starting small in the etsy shop. If I don't I'll get too bogged down in the already colassal to do list I have. So here are my first shots at wine glass charms. I'd actually made a bunch of these for the wine and art fair I did back in 2009 and I actually got a couple sales. Hopefully someone on the internet will like them too. I have a handfull of colors and welcome any recommendations or orders. Even just a shout out to see something in another color is a welcome challenge. Shops not quite live yet but we're talking in the next day or too. I'm back and back to an old home, blogger, and starting a new home, etsy. 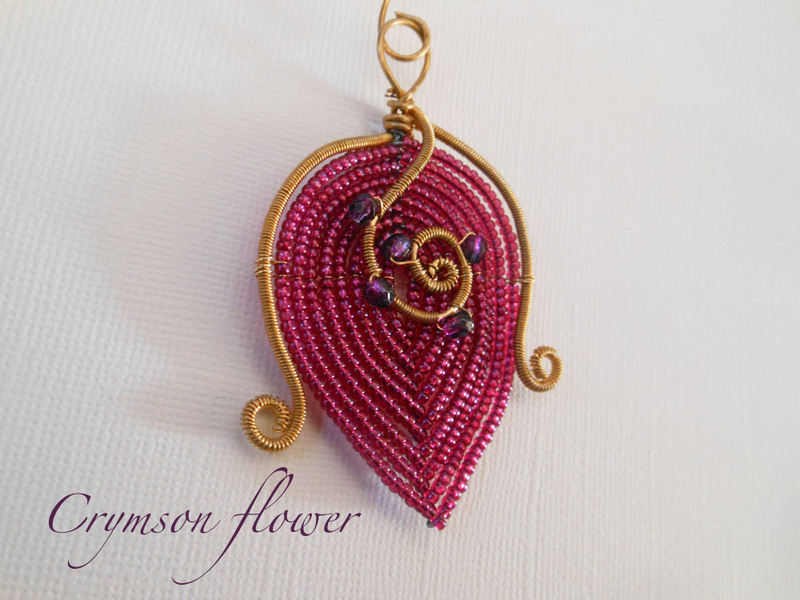 After a 3 year break from beadwork I picked it up again. It was one of the scariest things, even though I wasn't expecting it to be scary. 2 months ago I was certain I'd never bead again or at least not for another 10years. 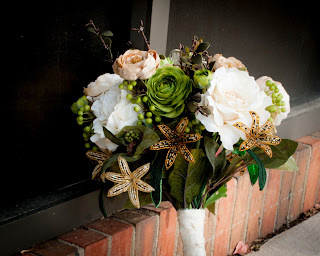 But my friend got married and I had given her some flowers from my stash to be used in her wedding bouquet. It looks so amazing. Her florist combined the beaded flowers with silk flowers and it really worked. She'll have that for the rest of her life. It was that inspiration, riding the high of a having fun at a great wedding reception, I dug out some beads and started playing around. It was like I never stopped. 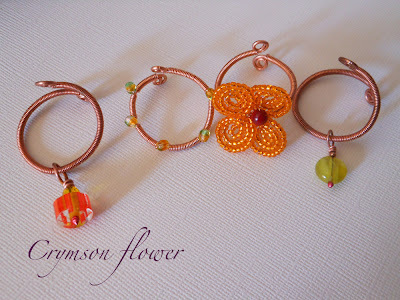 My fingers were a little ripped up from the wirework but the designing aspect was just as much fun. 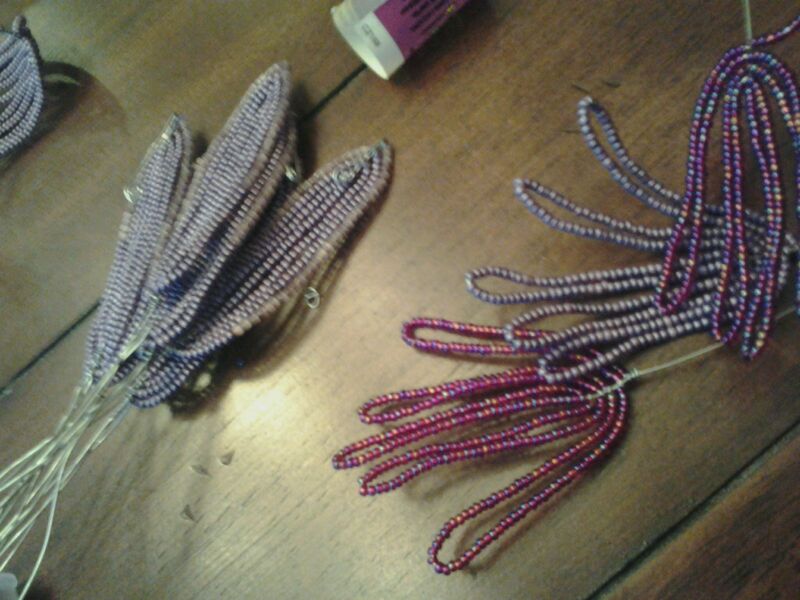 I didn't even mind stringing the beads. It's been a few weeks now and I have a pile of creations. Since I started right where I left off creatively I might as well in the buisness end too. 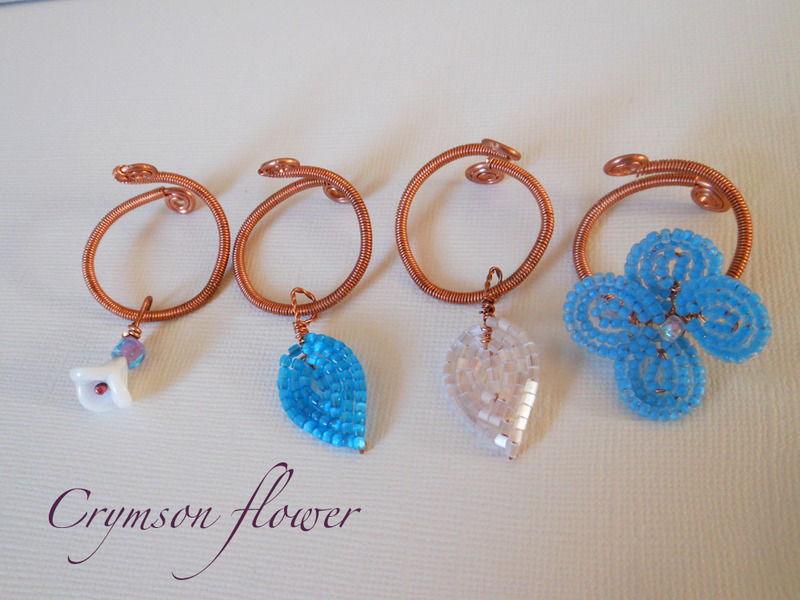 I was dabbling in art/craft shows right before I stopped. I've decided to maybe do a few local small shows...but more importantly I'm opening an etsy shop. I'm not live yet but will be by the end of the month. I'm excited. I'm more organized and mentally ready to do this than I ever have been.